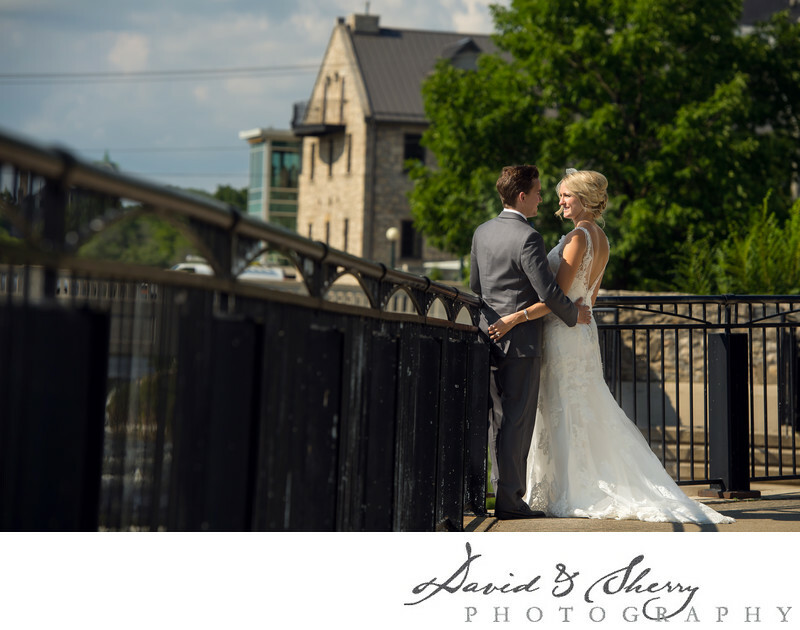 Once you have walked down the aisle at Cambridge Mill and finished your wedding ceremony it is common to head across the street to Mill Race Park. We've always enjoyed shooting formal wedding photos at the Mill Race, it has within it a great diversity of angles, large spaces and small, and different kinds of lighting which allows us as photographers to create a beautiful selection of images for weddings we photograph there. 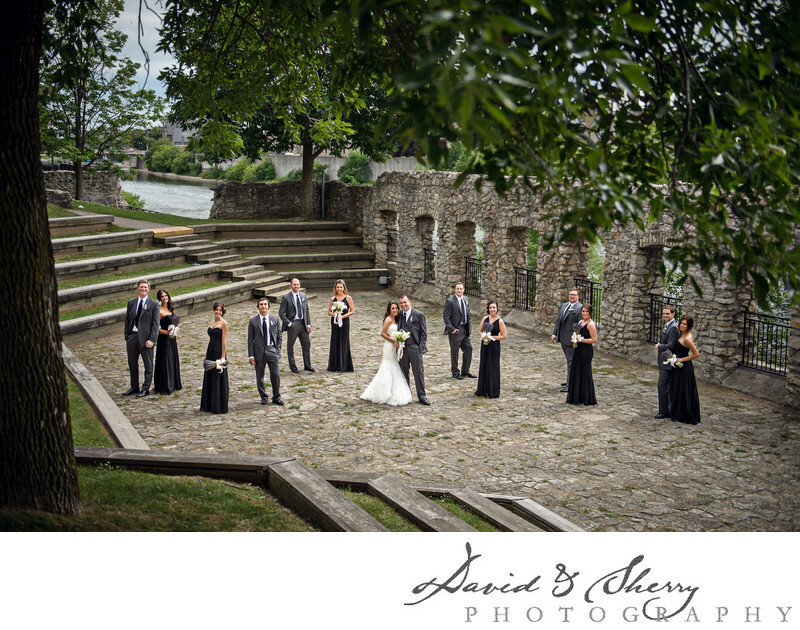 Creating wonderful Vanity Fair style group photos of you and your bridal party is a very important task on your day. We are continually looking for interesting dynamic posing to compliment your party as you have all spent so much time and energy picking your bridesmaids dresses, and groomsman's tuxedos, having the girls get their hair and makeup done, creating stunning bouquets and having put all that together it is our responsibility to create fantastic bridal party pics. In this particular photo I had to search around for an excellent angle that provided shooting from the direction where the light on the wedding party was best and framing it in such a way where your focus goes directly to the subject. Once we have our location the challenge becomes positioning people quickly, efficiently and with fun in a way that showcases you and your closest friends. What we are trying to accomplish with our group posing is to stagger each person or small group of people to provide depth to an image which is often shot in a line. We will put two or three together and treat them as one, then move on to the next person or group. We then step back and make sure our spacing is correct, and then give each girl and guy specific posing to compliment their body and to bring the most out of the dress they have so carefully chosen. Within the gates of the park there are three distinct areas to use. As you walk in there are garden lined walkways and bridges over some water features. Through here the light plays through the trees and allows us wonderful opportunities to take intimate pictures of the bride and groom as we need smaller spaces of light to capture these photos. Once you have walked over the bridge you come to the main amphitheatre area of the park. Here is a wonderful area to do group photos, family photos and large bridal party pictures. The even lighting and the backdrop of the old stone wall as well as our ability as photographers to get up on the seating and elevate our position to change our angle gives us all sorts of possibilities. 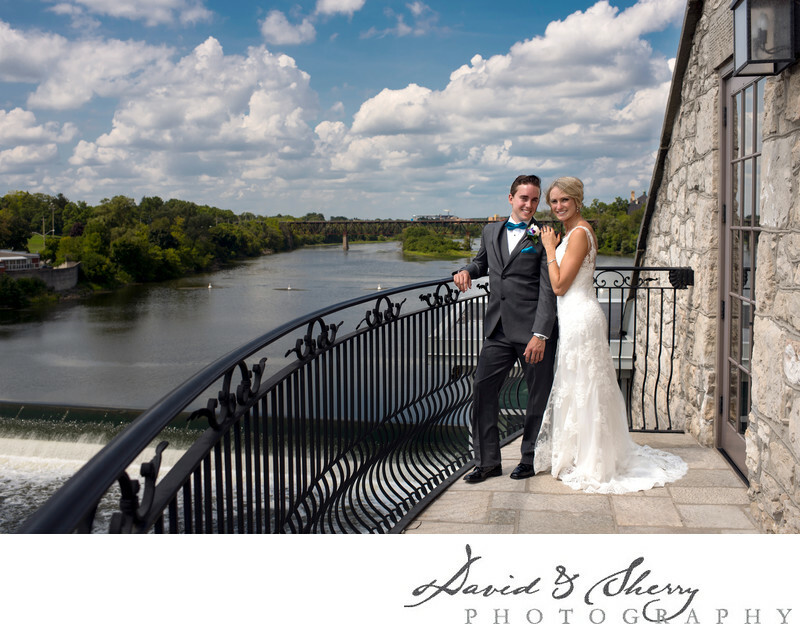 Along the back of the space we can shoot along the wall to give the images depth and can include pictures with Cambridge Mill in the background giving context to your wedding photos. On the other side of the amphitheatre is a walkway out of the park. This view points towards the old city skyline of Galt with the gothic inspired spires of the churches and the old development from a 100 years ago. You also get wonderful views of the river. Turn around and shoot the other direction and you will have a compressed composition of cambridge mill in behind the trees which dominate Mill Race Park. This truly is one of the best wedding photo locations in Cambridge and the only dedicated photo park that I have every seen. 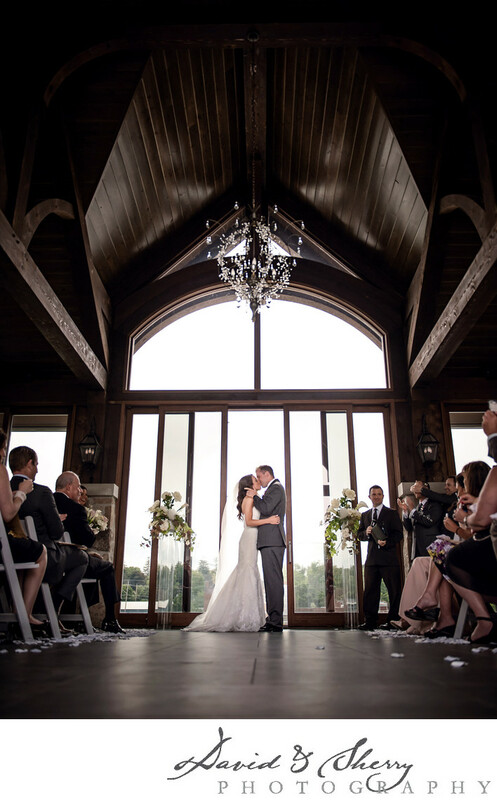 This makes Cambridge Mill a much more desirable place to have weddings because you aren't locked into only it as the backdrop to your photos, you have countless options available to you right across the street. We love to create these types of photos and though it won't seem like it took very long on your wedding day the result will be well worth it. We often have couples print these photos very large to display on a wall in their home or have them take up a full page spread of a wedding album.